Nowhere in the world have I come across the magic that is Carnival in Maastricht. The people, the music, the atmosphere, the sheer joy of life make it a magical celebration. Age, language, nationality and social status are all forgotten as everyone comes together for a wonderful three day party. It reminds me of a gigantic British pantomime: everyone dressed in a colourful mixture of costumes, with music and singing. There is no script and no director, and yet each year it comes together beautifully. My advice to anyone is that you have to experience it. Enter into the whole spirit of Carnival with and open mind and heart. Don’t try and understand it too much, just go with the flow. We Brits are known for having a stiff upper lip; this won’t work at Carnival as it will get caught on something as you squeeze yourself through the crowds. 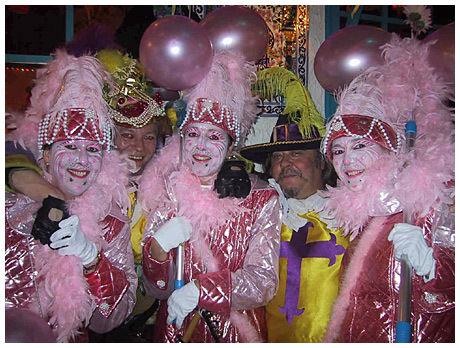 As an English woman living in the Netherlands, my first taste of the traditions of Carnival was the Sunday before the 11th of November in 2004. This was for the choosing of the annual Carnival song, when people vote for the best new song written that year. I didn’t understand a word, so my vote was for the tune and not the words. I find singing la la la la to most songs worked well for me to start with and still does on occasion. Friends and family from Maastricht will often try and translate the words and meanings of songs for me. This often results in hilarity for us all. The words don’t always have a meaningful translation. Once it was explained to me that a song was about cows dancing in an Alp meadow. My expression said it all. My next initiation to Carnival was on the 11th of the 11th. This is an important date for the people of Maastricht, as it hails the start of the Carnival season. 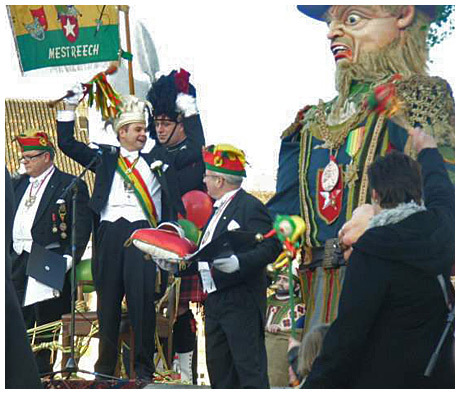 The Carnival season is called the 5th season in the Maastricht area. 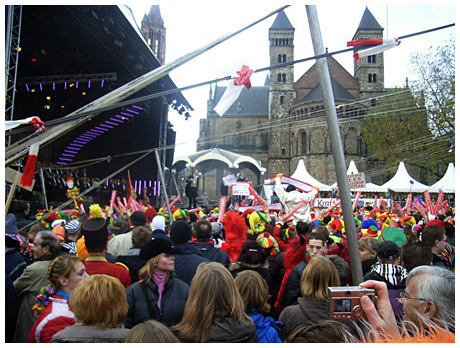 The whole Vrijthof square is filled with people singing and swaying to the live music taking place on stage. I didn’t need to understand the words in order to get swept along with the atmosphere and spirit of music and beer on the day. Having just got to grips to slightly understanding the Dutch language, I was completely lost when trying to understand anything that was said to me. Don’t let this deter you. Everyone was willing to try and speak English and if all else fails, facial and hand gestures work well in any language. I must admit that I did sneak away a couple of times in search of a good cup of English tea. I am lucky to be able to see Carnival through the eyes of the ‘drunk band’ ProBeerDers to which my Maastricht partner and I belong. He was born and bred in Maastricht and it is through his love of Carnival and Maastricht that I have been able to get an insight to the real spirit that is Carnival. We live away from Maastricht, but return for family and Carnival events. I am known as the international member and as much of an oddity for the fact that I rarely drink beer. My capacity for tea is a source of great amusement among the band members. Being part of the ProBeerDers gives me a chance to be part of a group of Carnival fanatics. They have welcomed me with open arms and embraced the fun and challenges of having an English member in their ranks. Even though we are called a drunk band, I think this must apply to the music and the way we play it, as much as to the beer we drink. There are a number of drunk bands in Maastricht. There is no record of the exact number, but it is over 40. We can be seen playing traditional songs as we march from bar to bar. Each bar is treated to a number of songs played with great enthusiasm and gusto. The quality of the music luckily is not so important as long as the tune can be recognised. It is then time for the band members to enjoy a beer or two. We chat with old friends or instant new ones before once again it is time to move on. Bands can vary greatly in size, with many avoiding the busier bars, due to the lack of space. Each band has its own colours and flag. We all share the love of making music. When two marching bands, both playing different songs, happen across each other, well … I can honestly say, I have never heard anything like it. A development for the worse in the past few years is that bars seem to be playing their outside music louder and louder. This has made it difficult at times for passing drunk bands to continue to play. I find the people of Maastricht to be welcoming and happy. Age is no barrier to having fun at Carnival time. Young and old mix and celebrate together. From the youngest in a pushchair to the elderly, everyone joins in with the same enthusiasm and love of life, rarely seen anywhere else. There are no social barriers. The fact that everyone is dressed up and keen to have a good time removes all of the usual inhibitions. Everyone meets on an equal footing. No matter how full a bar is we are met with smiles as the band squeezes its way in. Our drums, trombones and the flag held high, we play our way through the door. This is where speaking English really comes in to its own. Calling out ‘make way for the English’ as I squeeze through usually has the effect of making people turn around and then I quickly move through the space. During Carnival the bars are usually full to overflowing. Don’t let this put you off; there is always room for one or two more. The traditional music playing and the Carnival decorations all add to the spirit of Carnival. Everyone sings along and will make room for you. Our band carries a beer tray at all times, which holds up to 30 drinks, this is at least as important as our musical instruments. A very common mistake for people visiting Carnival, as I soon learned, is to dress up at the wrong times. On the Friday evening visitors from outside Maastricht can be seen in the town in full Carnival costume. It is very easy then to spot the non-locals. They then repeat this on the Saturday, another day when the natives of Maastricht don’t wear their Carnival costumes. Wrong again! On the Sunday, the first official day of Carnival, everyone is dressed ready for the festivities. It is often then that the visitors having got it wrong for the past two days decide to play it safe and wear their everyday clothes. They could not be more wrong! Once again they stand out in the crowds. Strong shoes are a must, cobbled streets and busy bars are stomping grounds not style parades. Costumes should fit well or you are likely to leave half of it behind as you make your way through a crowd. They can vary greatly. 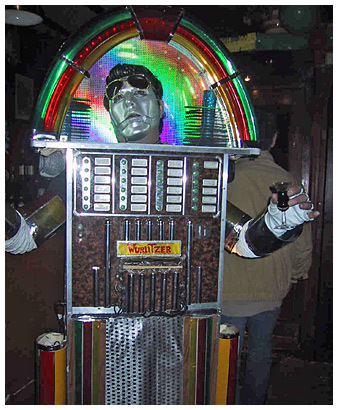 Anything goes, from someone wearing a coat inside out to a working jukebox. Each year a new prince is announced exactly four weeks before Carnival. His role is to lead the people of Maastricht to and through Carnival. This is the first opportunity of the Carnival year for the drunk bands to play en masse to the crowds. I find the traditions and speeches surrounding this harder to follow as a non Maastricht dialect speaker. I do however love to follow the Prince’s arrival at the railway station on the Saturday, the day before Carnival Sunday. His procession as the crowds completely cover him in paper confetti is hilarious. Already Carnival activities are underway in Maastricht. Sunday 27th January will see the battle of the bands. Each drunk band along with a Carnival club official will entertain both the people of Wyck (on the East bank of the Maas) and themselves. They are then judged on the level of entertainment enjoyed by all. A barrel of beer, a trophy and a taste of carrot cake is then awarded to the winning drunk band. Then we come to Carnival itself. I can’t wait. My costume is packed already along with my good walking shoes. Maastricht I am ready!